I had fun with this composition. It started as a free-form design but instead of coloring the bounded areas, I left most of them empty. I was inspired by Joan Miró’s work, especially his constellation series. I filled in some of the smaller shapes that were formed by overlapping lines. I looked for strange creatures in among the larger shapes. I put eyes everywhere. 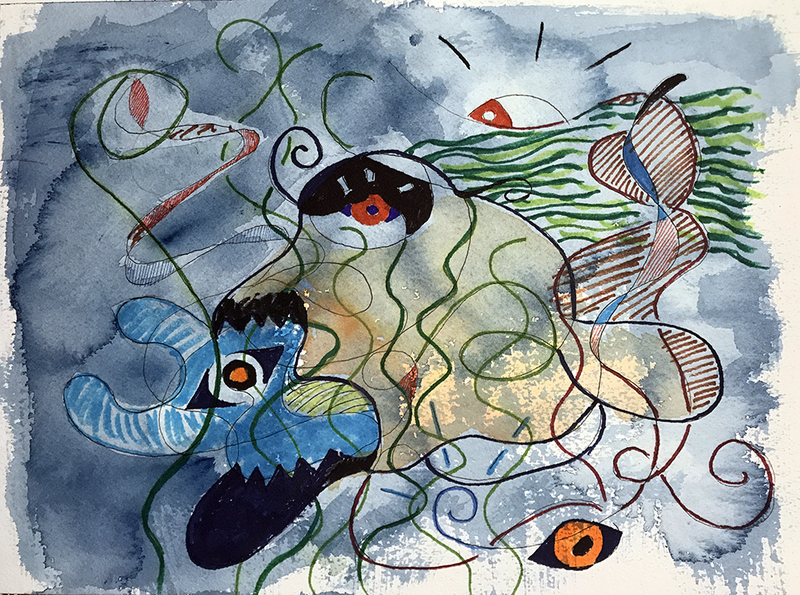 This entry was posted in Personal Stories and tagged abstract art, artistic process, creativity, drawing, free form, Joan Miró, painting, visual arts, watercolor. Bookmark the permalink. I think this is very Miro-esque. Love it. Especially the eyes. Thanks, Claudia. The eyes are a direct copy from some of Miró’s work. Fantastic. Miro is a long time favorite of mine. I love this one too. Also the name. It fits and adds a bit of intrigue. Thanks, Deborah. I was thinking about those deep sea creatures that live in the dark and are wonderfully creepy.